We had a long haul this year to make the Virgin Islands sailing 1598 miles this year compared to 1499 last year. This meant just over 12 1/2 days compared to just under 12 on last years run, but our average speed for both years was the same at a painful 5.2 knots. 10 of 12 days we had to sail a tight close reach trying to balance boat speed and our heading to make the best velocity made good. Finally, on our last day the fabled easterly trade winds arrived and we could point the boat directly at our destination on a beam reach averaging 6.5 knots for the final stretch into St. John, USVI. We were fortunate to have favourable conditions to make a safe passage despite the amount of rain we had the first few days and the less than ideal wind direction for the bulk of the trip. We only saw sustained winds of around 30 knots for a couple hours and the worst seas were probably 10′. Hard to ask for better in this regard on such a long passage. The trip started on a positive note and we rode the ebb tide out of the Hampton and then the Cheasapeake Bay gaining a boost of up 2.5 knots. Winds were northerly and we reached down the coast staying inside the gulf stream. The plan had been to get south of the north winds before entering the gulf stream off of Cape Hatteras, but the north winds stayed a little further south than forecast, so we found ourselves at our target entry point with 20 gusting 25 knot winds opposing the current. We made the decision to go for it and it was actually not a bad ride. Sure the waves were a little tighter pitch, but with the wind and waves on the stern quarter we were able to steer a heading making a VMG of 6 kn across the stream. Half way through the winds shifted to the North-East and it ended our ideal heading. We found ourselves close reaching and losing a good portion of our speed to the current, so when the wind lulled for a couple hours we motor sailed to point as high into the wind as possible and exit the gulf stream. At this point our Autopilot began to act up. It was throwing error messages that shouldn’t be possible for its configuration on a sailboat and we hand steered for half a day. Mysteriously, after dinner on the start of day 3 I engaged the autopilot and it worked, so neither one of us dared turn it off and that became the start of the Otto’s (yes we nicknamed our much loved electro-mechanical crew member) final 30 hours of life. We sailed a close reach in NE winds doing our best to make progress east as we were confident that this year we would see those fabled easterly trade winds allowing us to make great progress over the final few hundred miles to the Carribbean. Unfortunately, the NE winds gave way to ESE winds almost a day sooner than our departure forecast had predicted and that began the start of the real windward slog. The forecast called for brisk winds for the next several days, so we pulled our working jib down in favour of our much smaller ‘spitfire’ jib. This smaller jib payed for itself on this trip as we spent a couple of days close reaching in 20-30 knot winds and were actually making a little progress east which we certainly would not have been able to do with a partly furled working jib, and the flatter cut sail kept the boat more upright which is a huge benefit for comfort. Eventually the winds shifted further south and we found ourselves pointing at the Turks and Caicos, so we made the decision to tack to the ENE to work on progress to the east. Up to this point it had been a rather wet trip. The first few days had seen a lot of rain squalls, so the cockpit never seemed to dry out and we found ourselves putting on wet foul weather gear as it just didn’t have enough time to dry on our off-watch shifts. Then we found ourselves close reaching in rather brisk winds and moderate seas which is a heading that sends a lot of salt water spray from the bow, right across the deck to the nut at the wheel. So when the rain squalls parted after about day 3, we endured close to 5 days where we probably got an average of 10 drenching salt water showers every hour. Yes, the cockpit on the Antares 44 catamaran looked awfully attractive at that point. We even had a wave knock our port bow navigation light off the bracket leaving it dangling by the wire until a subsequent wave took the light clear off the wire. Not a big deal as we use a mast head tri-light for our running lights at sea – something that should be mandatory as nobody can see the deck level lights at sea and a few skippers need to realize this. The next few days were much the same, heading ENE when the winds were from the SE, and heading South when the winds were from the ENE. The SE winds were apparently persisting due to the track of tropical storm Kate which at that point had shifted north of the Bahamas en route to Bermuda. We were fortunate to have left port when we did as we well clear of the storm, and yet were far enough from the caribbean when it had previously been a tropical wave causing some nasty squalls and rough nights for the faster boats that were a couple hundred miles ahead of us. 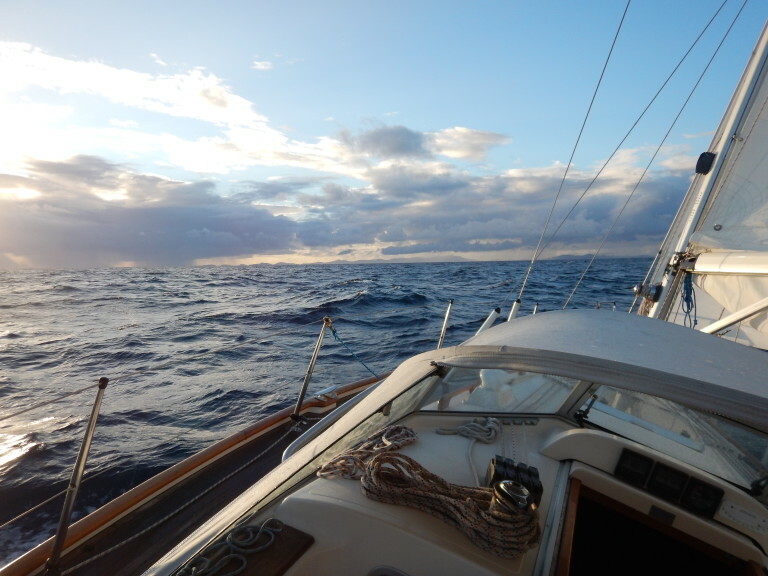 Towards the end, we had a few lighter wind days so we motor sailed when the winds lulled allowing us to steer a little closer to our destination and then sailed when the winds piped back up. Our final stretch saw us motor through a calm for nearly 24 hours which then gave way to gradually building easterly winds. Ah, those fabled trade winds. Our boat speed quickly shot up and we gently cruised at an average of about 6.5 knots for the final 24 hours on a beam reach. So there you have it. Day 1 and 12 had favourable reaching conditions while everything in between, was a wet windward slog. We pulled into St. John on Saturday and launched the dinghy. We headed into Cruz Bay to clear customs where they told us we didn’t need to because we had come from the US directly. Go Figure. When we are in the US mainland we have to phone in every time we move, whether it is only 10 miles, yet here we sailed 1600 miles, well outside of US waters for the trip and we could have just raised our VI courtesy flag. Oh well, better to be safe than sorry. Margarita Phil’s was next, where we enjoyed chicken tacos and of course, margarita’s for lunch. We grabbed a few groceries and are now resting in Christmas Cove. Yesterday, our dock neighbours on Sapphire Breeze (from Bay Moorings in Penetang) pulled in. They too had just arrived in the Virgin Islands, although they had opted for a slightly less torturous means to get their boat here. We invited them over for drinks, and turns out it is a small world. Their daughter and her boyfriend are visiting. He’s a Cape Bretoner. Same graduating class as Chrissy. What are the odds? Anyway, time to go. 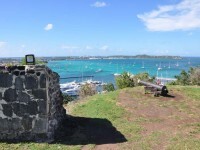 We need to be in the BVI’s by Friday or else Magnus’ paperwork expires and I need to determine this morning if we need to cobble together the funds for a new autopilot and order it this afternoon, as the USVI is a duty free port, while the BVI’s will impose somewhere between 5 and 20%. Good to know you arrived at the Islands, sounds like you sailed through some very challenging weather. Magnus can now dry out his wet weather gear and look forward to long sunny days for the months to come. Looking forward to travelogs as and when your time permits. Magnus is certainly happy to have his regular shore leave again. Now we are working mats out of his fur that presumably are from him being wet and salty for so long, although it was his own doing as he was encouraged to nap in the shelter of the dodger. I did follow your track on the Salty Dawg website, noticed the change of tack to ENE and the fact you were not moving any faster than last year. But, you arrived safely, which was the objective! You allude to the fact that Otto gave up.. is he completely kaput? Enjoy the weather there, and I look forward to Chrissy’s eventual Cooking Aboard Altera illuminations! Maybe one day we will do the passage and get to ride the beam reach for a few days to enjoy the much smoother and faster ride… As for Otto, a bit of a mystery. The flux gate compass was reading a reciprocal course for day 2 and 3, then the control display flickered a lot before it gave out which I found the cause to be a blown 25A fuse. I replaced the fuse underway and it blew in about 2 seconds, so we were both convinced the computer was dead. Today I disconnected the linear drive, cleaned some connections, powered up the system and everything came to life. 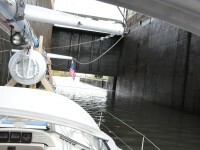 I then plugged the drive back in and while at anchor we were able to engage it and turn the rudder. So now we wait and see how it goes. I have to say that you’ve confirmed that sailors have a lot of nerve, courage, and determination, while being a bit crazy at the same time :-). I can’t imagine being on the water for 12 days straight, especially at night, facing changing conditions and getting soaked with a salt shower every 5 to 10 minutes for five days. It makes cruising in a Ranger Tug very appealing! Congratulations on your safe arrival. Enjoy your blog; I’ve read every post since you’ve started your adventure. Hi Ron, I agree sailors are a bit crazy, or maybe I have gained the wisdom now to recognize it! I’ve seen the Nordic Tugs before and absolutely love them, and assume the Ranger Tugs are similar. Sounds like a great way to explore the lakes and inland canals, do one or more of the ‘loops’ or even venture to the turquoise waters of the Bahamas. We hope to do “all of the above” (Great Lakes, Trent-Severn Waterway, Rideau Canal, Erie Canal, Great Loop, Bahamas) in a Ranger Tug after I retire. Enjoy your time down south!